Never settle it with a time trial. Well, unless you’re willing to tweak it. Brilliant job drawing me in with three straight weeks of intense racing, minimal discussion of drugs (I’m choosing to ignore the race speeds), relentless climbs, beautiful scenery, whacked out fans, attacks, and the emergence of several exciting young riders including one from Big Sky country. Like watching the fourth quarter of an NBA game, my normal routine was to forward the Tivo to the final 20k after an early morning run or swim. Finally a Tour with some suspense. Then deciding it with a 42k Time Trial?! After three weeks of watching guys throw down against the elements, the geography, and one another, let’s all stare at our wrist watches. Boring. As. Hell. Without a rider like me out there as a frame of reference (“Byrnes is 9 minutes down at the first time check”), it’s impossible to appreciate how fast they’re going. And because they race individually, it’s like watching 19 separate Kentucky Derbies. Or 12 separate 100 meter Olympic runs. I know, what if in London we have Phelps swim, and then Lochte a few hours later?! Or at the next heavy weight fight, why don’t we just measure the respective force of each combatants’ punches (against a bag) and then tally up the results. Riveting stuff. Easy to fix and happy to help. Instead of sending Andy Schleck three minutes after Cadel Evans, send him 57 seconds before him (his advantage at the start of the stage). That way there’s the potential to see Cadel gradually close the gap, or in actuality, not so gradually. Imagine how cool it would have been to see Cadel reel Andy in within the first third or half of the ride. I would have loved seeing him let Andy dangle, dangle, dangle, until deciding now is the time to CRUSH him. Even better. As Cadel closes in, Phil and Paul go completely silent as the theme from Jaws starts playing softly, then progressively louder. At the same time, all the fans lining the course make the universal shark sign right before the pass. A plane ticket to France. A croissant. Schleck’s ashen face. Priceless. Or like in baseball, let each racer pick their “pass song”. Again, 30 seconds before the pass P&P go silent and the tune slowly builds to full force. I’ve thought long and hard about my “pass song” and I’m going with Busta Rhymes, Lil Wayne, and Chris Brown. . . Look at Me Now. The toughest sporting event in the world desperately needs a grittier, more dramatic ending. 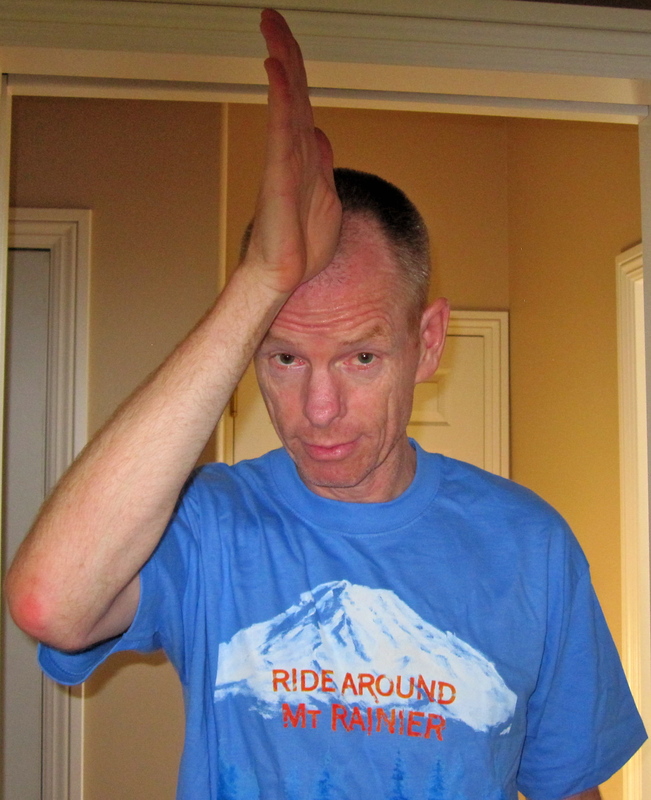 And yes, Monday will be more tolerable thanks to my 2011 RAMROP (Ride Around Mount Ranier In One Piece) report. New Normal #3: Try a little tenderness. Take some time with people. Phil Mickelson signs for 20 minutes after every round, Tuesday or Sunday, first place or 100th. On a good month, you do 20 minutes. Try it once. You might like it. Your every moment on a golf course doesn’t have to be Elvis being rushed out of the Hilton. Take some time with people. Say hello. Stand on 18 once and watch a guy finish, then shake his hand. It’s not going to kill you. New Normal #4: Enough with the emperor act. Climb down from this ivory tower you live in. Introduce a little transparency into your life. Give an interview once in a while that isn’t being timed by your agent standing in the corner. Tweet more than once a month. New Normal #5: Spread it around a little. Look, everybody knows you’re the cheapest guy on tour. Some people are sure your wallet is sewn shut. I know a car valet in L.A. that you’ve stiffed so many times, he feels like he’s full of embalming fluid. The last time he saw you, he stood in front of the car door, making small talk until you made with a fiver. Don’t be like that. Drop some coin. You’ll be surprised how it improves your disposition. Karma does exist, you know. Middle agers know they’re aging due to a growing list of aches, pains, and miscellaneous physical maladies. I take better than normal care of myself, exercise regularly, eat well, help old ladies across the street, and go to church when it’s not sunny outside. But I’m just as aware of the aging process because of changes in my thinking. For example, I used to think people could, with concerted effort, change aspects of their personalities. Mean guy could become nicer, superficial woman more substantive, impatient person more relaxed, angry person more caring, self-centered guy more selfless. Not anymore. Sure someone can drop weight or stop drinking, but some people are just mean, superficial, impatient, angry, and self-centered. Have been for a long time and will continue to be. Earth to Double R. Just like my personality and yours, Tiger’s is never going to change. “I got away from my Buddhism.” Yeah, you think? Did you see Darren Clarke signing autographs on the WAY to the FIRST tee on Sunday afternoon at Royal St. George’s?! Did you hear Rory McElroy after the US Open say he “couldn’t wait” to join his friends at home in Northern Ireland to celebrate. Genuine, personable dudes. Tiger is not likable, just phenomenally talented at golf. New Normal #1: Learn how to accept people’s flawed personalities. Save your breath about how you want them to change. New Normal #2: When an athlete acts reprehensibly, do what most elementary students learn to do during recess in first grade, ignore them. So the guy fired his caddy. He hasn’t won in a long time, isn’t playing currently, and isn’t really deserving of your media spotlight. Then again, maybe I’m wrong. Maybe there’s hope for Tiger because you’ve fundamentally changed your personality. Religious conversion, counseling breakthrough, whatever. Total personal makeover. The comment section is open. Do tell. I would love to be proved wrong, but I’m not holding my breath. We must learn very specific lessons from this tragedy to prevent similar ones in the future. First though we need to read and reflect on the horrific accounts, look at the heartbreaking pictures, empathize with the victims and their families, and grieve. The word “tragedy” isn’t sufficient. We learned from Norwegian friends’ Facebook accounts that two of the dead are from Hamar where we lived for a semester a few years ago. Our closest Norwegian friend’s 19 year-old daughter lives in an Oslo flat. My email generated an automatic reply, because like most Norwegians, she’s on vacation. There’s no way to eliminate xenophobia, hatred, or evil, but we can monitor fertilizer sales, restrict gun ownership and ammunition sales, and tighten security so that one can’t fake being a police officer. In starting to problem solve, I’m not heeding my own advice. There will be plenty of time to discuss the lessons and debate how best to limit such colossal acts of violence. Now is the time to sit in still, sad, solidarity with Norwegians near and mostly far. Time to circle the mountain again. Next Thursday. I’ve taught less than normal this summer, as a result I’ve ridden more consistently and I feel as good as I’ve ever felt on a bike. To borrow from one friend, “I’ve been climbing like Landis on crack.” I’ve got the base, I’ve done the climbing, and I’m happy to report that despite our country’s finances, they’re still handing out free ice-cream bars at the finish. I’ll be the blur on your left. Listen for the whoosh. First Things First—Are You Entrepreneurial? How, in this challenging and extremely dynamic economy, are young adults supposed to pick a field of work and carve out a career? Conventional wisdom, go to as selective a college as possible and focus on pragmatic coursework, is woefully incomplete. Among other things, it leaves out a critical component, self-understanding. For many young adults, choosing a path is understandably overwhelming. For anyone feeling overwhelmed it will help to first figure out what type of worker one is. There are two basic types—entrepreneurs able and willing to find customers for their products or services and everyone else who agrees to work for well-established employers with built-in customers. Jennifer Hyman and Jenny Fliess, co-creators of Rent the Runway, are perfect examples of 21st Century entrepreneurs. They’re tech savvy, self-starters. My students, the non-entrepreneurs, are preparing to be teachers or nurses. Banking on school districts and hospitals to provide a steady stream of “customers”, they’re willing to earn modest salaries in exchange for greater job security and more family-friendly work hours. Of course once they start working, some entrepreneurs and non-entrepreneurs will switch paths with a teacher starting her own independent school or a business owner deciding to work for a well established company. To determine which type you are take enough part-time jobs and internships so that you can meaningfully compare and contrast the two. Shadow entrepreneurs and non-entrepreneurs and talk to them about the ins and outs of their work. Take time to think and journal about your experiences and to talk to significant others about your impressions of both. Figuring out whether to start down the entrepreneur or non-entrepreneur fork in the career road should help make an overwhelming process more manageable. Another reminder. Life is fragile. Don’t take tomorrow for granted. Last weekend Julia Ann Rutherford was hiking on Aasgard Pass Southwest of Leavenworth with her boyfriend and two other friends when she slid down a snow face and disappeared over an edge into an opening about 5 feet wide. She was found trapped between a boulder and snow, partially submerged in extremely cold water. After reading this obit, I regret our paths never crossed. Julia was born on December 12, 1989 to Kelly and Bertha (Wold) Rutherford in Tacoma, WA and passed away July 3, 2011 due to a tragic hiking accident. She was named after her maternal grandmother. In kindergarten, she was suspended five times for expressing her individuality, intelligence and leadership skills. In junior high, she came and announced to her parents she would be playing football. She told them, “due to title 9, they can’t stop me”. By eighth grade, the boys had grown, she had not, and so she took up fencing instead. She had a natural talent for music, playing the oboe, flute, saxophone, piano and finally choosing the clarinet. She played the clarinet with the Eatonville music program and Tacoma Youth Symphony. She attended and graduated from Eatonville High School in 2008 as a National Merit Scholar. She applied to numerous universities and was accepted to nine out of the ten she applied to; including Yale. Instead, she chose to attend Pacific Lutheran University to be near her family. She completed three years double majoring in physics and chemistry and planned to achieve her doctorate and become a research scientist. While attending PLU she was active with the orchestra, chamber choir, bicycle club, and chemistry club. She recently received a National Student Leader Award from the American Chemical Society. Julia was an accomplished fencer and loved bicycling, sailing and hiking. Julia lived her life with no regrets. Everything she did, she did with passion giving 110%. She will be sorely missed and remembered by her loving family, many friends, colleagues, and PLU community.